Fighting strength of the trapped Stalingrad divisions on 28 December 1942. Fighting strength of the 21 encircled German Stalingrad divisions on 28 December 1942. 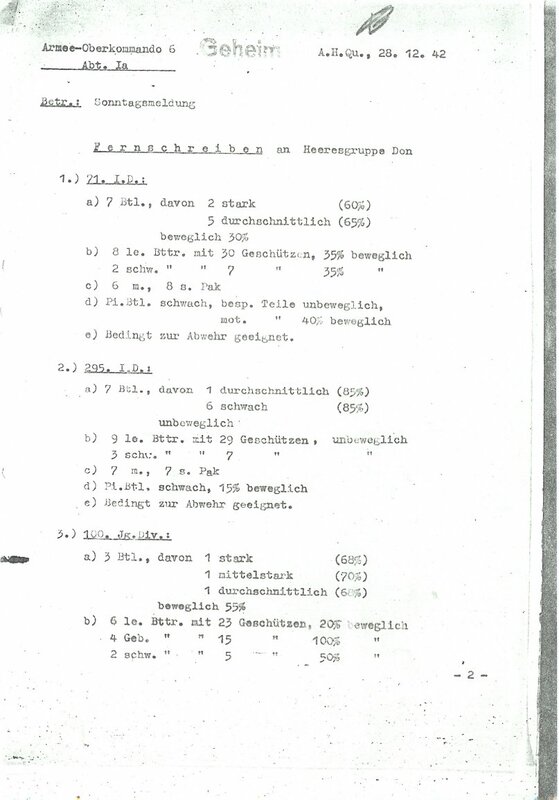 A teletype message of 28 December 1942 to Army Group Don. A copy of the first and last page of the document (Nr. 6014/42 geh.) is included. We notice that on 28 December 1942 the 29. Infanterie Divsion (mot.) was the only unit suitable an offensive operation. e) In circumstances units only suitable for defensive operations. d) Pioneer Battalion - weak : 50% mobile. d) Pioneer Battalion - worn out : 60% mobile. d) Pioneer Battalion - moderate : 5% mobile. d) Panzer Pioneer Battalion - weak : 100% mobile. d) Panzer Pioneer Battalion - worn out : 80% mobile. d) Pioneer Battalion - weak : 80% mobile. e) Suitable for defensive operations at any time. d) Pioneer Battalion - weak : 40% mobile. d) Pioneer Battalion - weak : 30% mobile. d) Pioneer Battalion - worn out : 80% mobile. d) Pioneer Battalion - moderate : 90% mobile. e) In circumstances units suitable for offensive operations. d) Pioneer Battalion - weak : 15% mobile. d) Pioneer Battalion - attached to other units of the division. 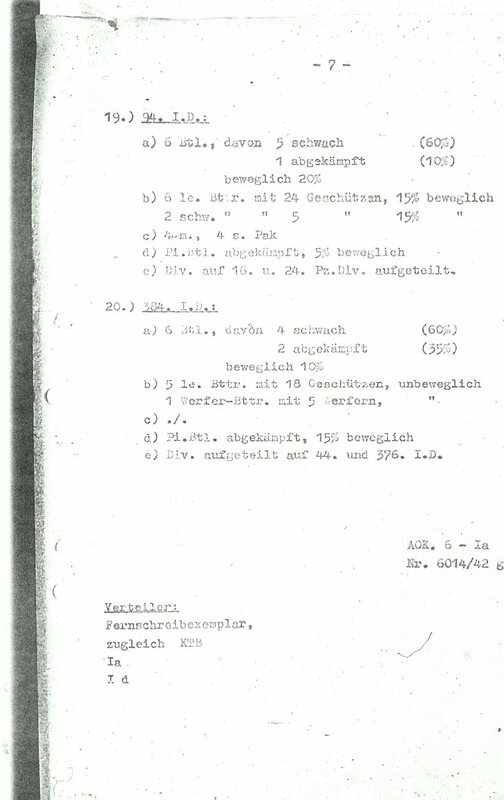 e) Units of the division attached to the 16. and 24 Panzer Division. e) Units of the division attached to the 44. and 376. Infanterie Division. The division, also encircled, was not a part of AOK 6. It acted as an independent unit in the Stalingrad "pocket". No numbers concerning strength are available. message of 28 December 1942 to Army Group Don. The first and last page of the teletype message of 28 December 1942 to Army Group Don.